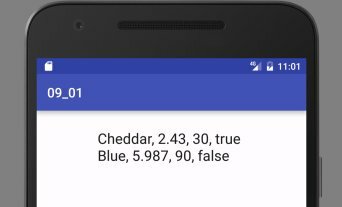 Objects can be a very useful tool in your Android app. Check out the code below which illustrates Java in action. This code contains real-life Java code to create two objects. A run of the code is shown here. The code above creates “two BagOfCheese objects” or “two BagOfCheese instances,” or you might say that the new BagOfCheese() statements instantiate the BagOfCheese class. One way or another, the code declares the existence of one class and declares another class — a class that declares the existence of two objects. Each use of the words new BagOfCheese() is a constructor call. the first statement declares that the variable bag1 refers to a bag of cheese. Finally, with the equal sign, the first statement makes the bag1 variable refer to the newly created bag. The next five statements do the same for a second variable, bag2, and a second bag of cheese.